Even Here!｜Business Description｜Houwa Engineering Co., Ltd.
Houwa Engineering realizes greater efficiency of production planning through the development of environmentally friendly plant, including maintenance. Helping our customers to create pleasant and secure spaces – that is what Houwa Engineering is all about. Freezing and air-conditioning are used in many different fields, but Houwa Engineering has advanced technology and an extensive track record in the area of food manufacture. We are a force behind the scenes that helps our customers provide reliable, high-quality food products. Here are some examples of our products and services. Our technology is used in various different places in bakeries and bread factories. For example, a high degree of reliability is required for temperature and humidity control in the fermentation chamber. We have one of the best track records in the country when it comes to installation of fermentation chambers. Picture the showcases in your neighbourhood supermarket. Those showcases do not just run while the store is open. They are running 24 hours a day, 365 days a year. 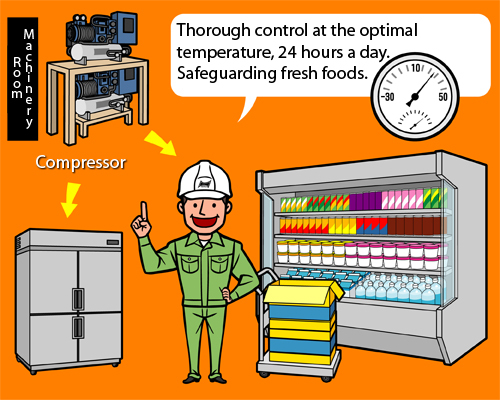 Thorough temperature control and maintenance of these showcases are what keep food products fresh and safe. 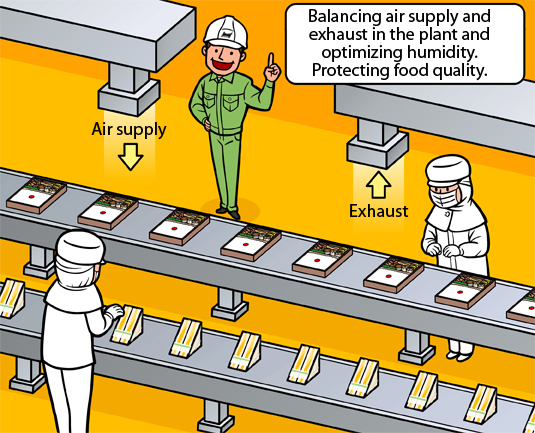 Food factories that make side dishes and bento meals. Leveraging our advanced technologies in areas such as water supply and drainage and sterilization, we contribute to food safety.